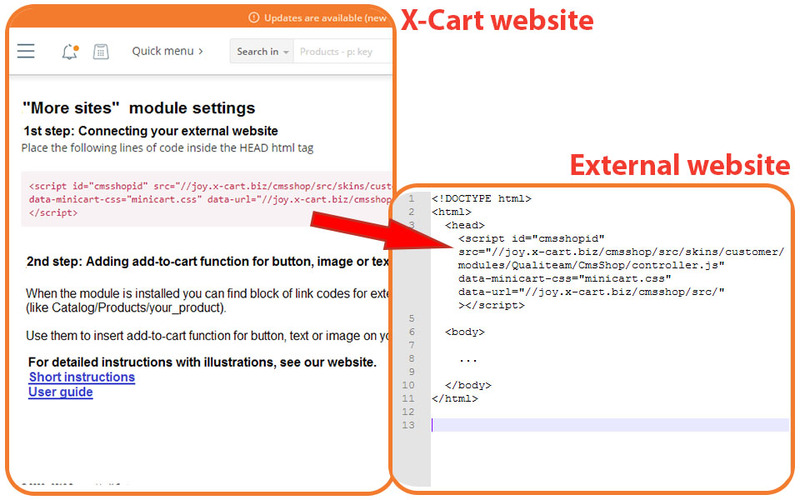 The module allows you to install a full-fledged basket-based widget tied to your X-Cart store on external sites / domains. To any element of the external site - text, photo, button - you can bind the option "put in the basket." At the same time, adding a product to the cart, the customer does not leave the page, but continues reading. You can make a blog, article, gallery or landing page additional windows of your online store. This is convenient if you sell complex, special, specific products. Or, if you just want to give the customer more information, more value, stand out among other sellers. When user presses the buy button the product is added to the cart whilst leaving the user on the same page. When user clicks a minicart he is redirected to the shopping cart page on your main X-Cart shop website. 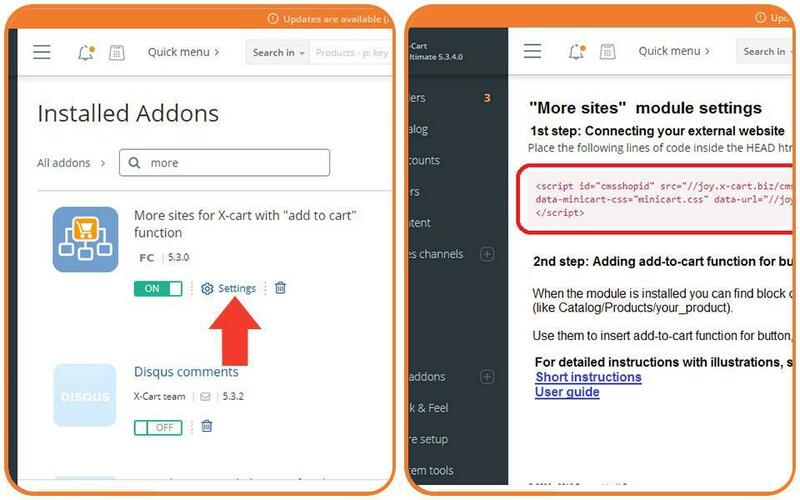 The module allows to connect the "Add To The Cart In One Click" function to any page element chosen by you (i.e. 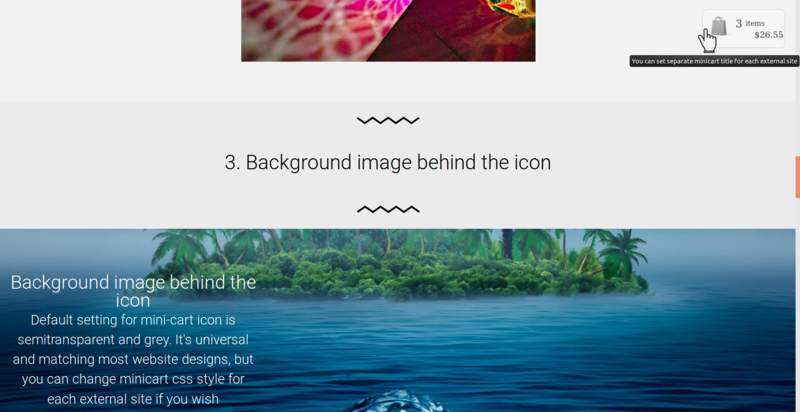 a button, a text hyper link and a picture); this can be done on pages allowing for JS code (even located in another domain). On doing this, a sticky mini-cart icon will appear in a corner of the given static page: the icon indicates the total number of the goods added to the cart and the sum; a click on the icon opens the cart of the main X-Cart site (where customers can see all their added goods and process the order). Technically speaking, after installation, the module generates a basic embed script (the script is to be placed on a page of an external site) and automatically generates "Add To The Cart" scripts for the goods (they look like hyper links and can be attached to the given elements of the external site / page – to a button, a text, or a picture). - stimulating your product sales using blogs, thematic websites. All this can be performed with a help of various special design and slicing platforms meant for creating nice-looking, functional and informative pages. - Have several sites in different domains and, possibly, different platforms and, still, process those orders in one and the same X-Cart shop? - Add static pages made with out-of-the-box X-Cart tools (done independently, with a help of an easy-to-use editor or a design tool allowing to create beautiful pages, simplifying page editing process and, at the same time, not integrated with Х-Cart)? 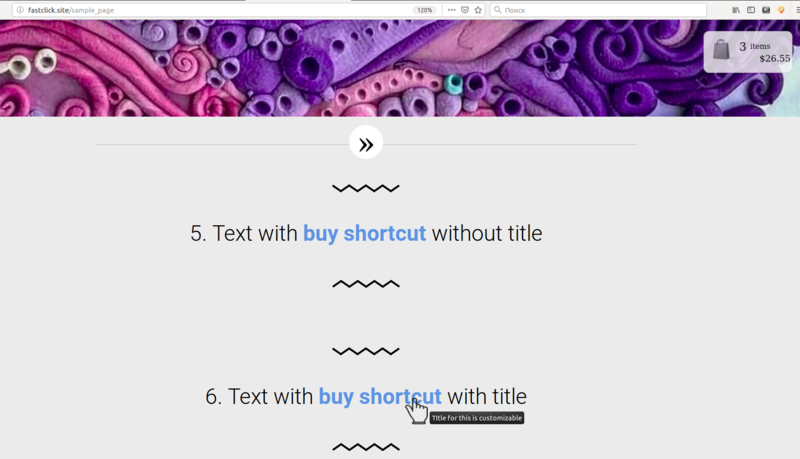 - Create informative sites describing a service or goods (in a form of a blog, an article or a gallery with comments) – and, at the same time, without annoying embedded product cards, yet allowing for a purchase? - Create a single product / service selling site (where there is no need in catalogue, flypages, product cards, standard shop windows; where all what is needed is a clear text, attractive design and simple editing possibilities; and where orders are processed through X-Cart)? - Create, on the contrary, a page for selling a complex product / service where a lot of information is to be delivered to the customer without any assistant's help? Extra showcases for your x-cart shop on your websites. One click adds product to the shopping cart and your customers continue surfing the complementary website. One click on the minicart opens the shopping cart on your main X-Cart shop to edit the order or purchase the goods.